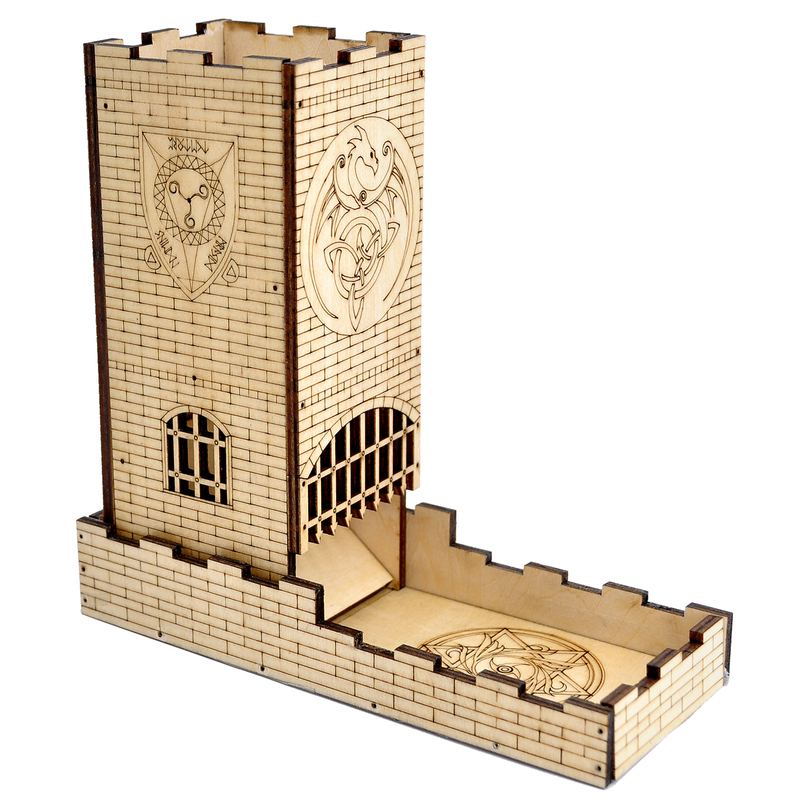 CASTLE DESIGN: This tower has been precisely cut and decorated with a high-powered laser engraver - It is adorned with a classic Dungeons & Dragons motif; Abjuration are engraved on the sides; On the tower front, the Dragon ampersand is deeply engraved over the dungeon, with the magiccircle adorning the tray front. PORTABLE AND OCCUPY LESS SPACE: 6.3" tall, 2.3" square pieces. The tray is also 2.3" square. 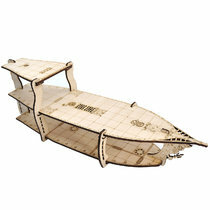 It is perfect for tabletop gaming without taking up much space. You can fold the tower portion up into the base tray, so you can store your lucky dice inside it and carry it where ever you go. EASY TO ROLL: Dice size up to a standard d20 can be rolled through. Even a full set of dice can be drop in the tower and roll to the tray without issue. RANDOMIZED AND UNDISPUTED: There are three intersecting steps for the dice to clatter around in the tower, so does a good job of producing a random result. Dice results are less likely to be argued after use our wooden dice tower! LESS TROUBLE: Using the dnd dice tower is much better than rolling on a table, no more dice flying off the table and no interference. Do not let your dice simply fall on the table, let them trundle down this cool tower! Keep your game pieces in place, your counters properly counting, and landscape scenery intact with this laser-engraved dice tower. Control your gaming environment and keep wild dice throws to a minimum! 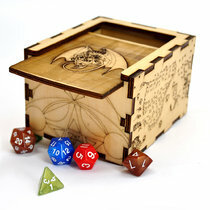 This dice tower is made of quality plywood and engraved with laser technology. Crafted of high-quality materials, this tower is sure to last many gaming sessions! The tower comes as a bunch of flat wood pieces， that you can easily fit them together by screws. 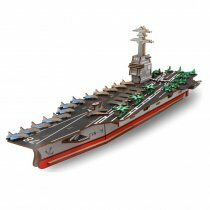 Once complete, it's solid, nice looking, and compact. You will be glad to buy it! - Portable, rolls awesome and it's not too loud. Imagine if you will, and you hear the dungeon master call out "The necromancers dark chant rises, and the spell shoots towards you in a dark green blur. It hits you in a flash! I need a roll." You know as you grab your dice this is a do or die moment. You could roll them on the table, but before you is a fantasy inspired dice tower! Victory is near as your dice drops and you hear the echoes if the plastic on wood! The entire table waits, eagerly waiting to see if you survive!